We first met Theodora (Theo) and her grandfather, Poppa, in Andrew Larsen and Irene Luxbacher’s 2009 collaboration, The Imaginary Garden. 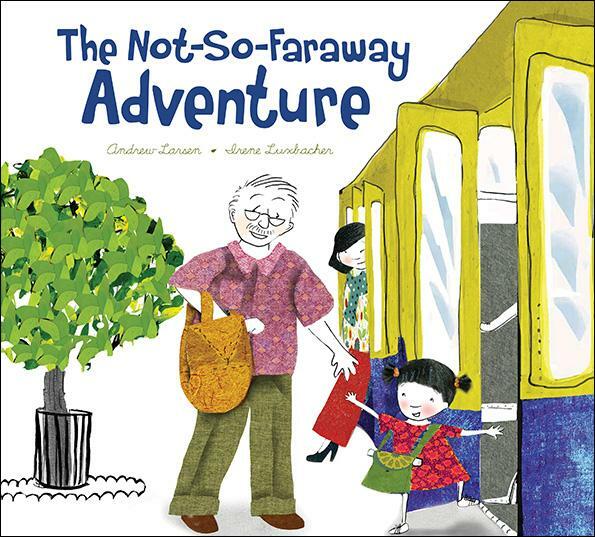 Their follow-up is a sweet tale that shows even the shortest of trips is full of opportunities for exploring and connecting. Whenever she visits Poppa’s apartment, Theo loves looking through his trunk, which is packed with mementoes from his many travels. The items inspire her to dream of becoming an explorer. Poppa’s birthday is coming up, and Theo ponders what kind of birthday gift he would like best. Poppa tells his granddaughter that he and her Nana once went on a drive to a restaurant on the beach to celebrate. Inspired, Theo suggests a similar trip – this time via streetcar. But first, the duo makes a map of their route (modelled on the map of New York City Poppa keeps in his trunk). Theo and Poppa clearly adore each other, and their relationship is a real highlight – as are Luxbacher’s richly coloured and engaging mixed-media illustrations, which are full of delightful details. In one spread, Theo and Poppa arrive at the lake and Poppa recalls that he used to play there as a boy, when he thought it was the ocean. Luxbacher overlays the blue water with finely rendered drawings of sea creatures and a pirate ship in white to convey this imaginary world. Words and images combine to form a story that gently demonstrates the value of teaching kids about their family’s past so they feel part of something bigger than themselves.